Halifax officials expect to have a dual-registration agreement with a Super League club in place by the end of this week. Discussions with the top flight team, one of three to have held discussions over a player-sharing deal, are at an advanced stage and Fax hope to conclude them before the weekend. Barring last minute hitches, the arrangement will replace the one Fax entered into with now-relegated Hull KR for the 2015 season - which saw just two players, Connor Robinson and Jordan Cox, make the temporary move - and should bolster head coach Richard Marshall’s selection options. A close-season of cost cutting at the Shay has reduced the size of Marshall’s first team squad to around 25 players. 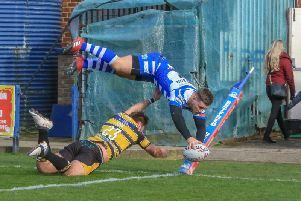 Star back rower Dane Manning has already joined rivals Batley (see separate story) after refusing to accept the 10 per cent pay drop - money the players will get back if they make the top four for the second time in three seasons - imposed to balance the playing budget after a disappointing 2016. And it has now been confirmed that prop Matt Haggerty, the former St Helens forward, will not now be joining the club. Haggerty, who played for a clutch of Championship clubs before getting a chance at Langtree Park, had been pencilled in as a replacement for Featherstone-bound Richard Moore. “Matt’s got some business commitments that mean he won’t be playing for anyone next season,” said Marshall. “It’s nothing to do with pay cuts; he’s apparently been offered a work contract that involves a lot of time away from home. “It’s a little disappointing, but if I’m honest I’m more disappointed I heard it through his agent rather than the player ringing me direct. Courier Sport understands that all but one of Manning’s teammates have now signed their new deals, which will kick in from January, minimising the risk of further high profile departures and completing a relatively bloodless round of money saving. And with the potential dual-registration deal likely to bolster Marshall’s options where he needs it most, at prop and, potentially, back row, Fax’s on-field position looks a lot healthier than it did a few weeks ago. There has also been de facto confirmation that Fax’s reserve set up has survived the cull, with the players from that side reporting for pre-season training on Monday. The squad put together by Martin Gonzalez yielded a handful of first team graduates, with utility back Nick Rawsthorne, who went on to sign a Super League deal with Challenge Cup winners Hull FC, the most spectacular success story.